Formulations - Page 4 of 11 - ThoughtForm, Inc.
What makes a successful B2B sales pitch? Support your sales team with communication tools. 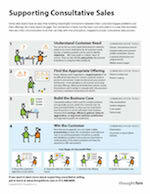 Use this handy one-page reference to discuss what support your sales team needs to better understand and serve customers.